I love questions about popularity. 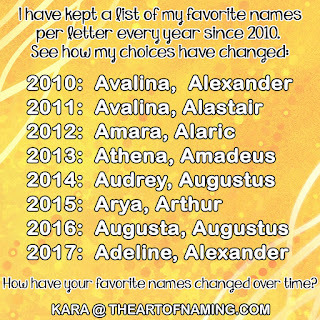 I am always wondering if parents choose names because of how popular (or unpopular) they are. And with that, do they also avoid certain names because they're popular or unheard of? The above poll focused on names that start with Isa-. It is no secret that Isabella was the #1 name in 2009 and 2010 after seeming to come out of nowhere suddenly in the early 2000s. In fact, Isabella was rather obscure, not even on the top 1000 chart, between 1949 and 1990. I didn't think to include Isabelle on the poll, but she's not nearly as popular as Isabella. That -a ending makes all the difference. Isabelle ranked at #126 in 2012, while Isabella is #3. Alternatively, Isabel ranked right behind Isabelle at #134. 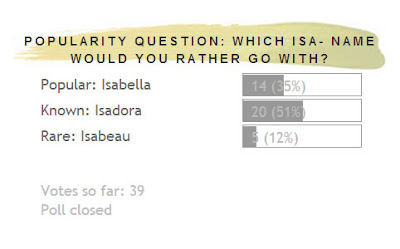 I wonder how many of you would have voted for Isabelle or Isabel. What about other options that don't have a bell chained to it? The lovely Isadora is my personal favorite. I would use this over Isabella any day! And the rare and unique Isabeau was the third option on the poll. Isabella is the latinate (Spanish and Italian) version of Isabel which is the Medieval Occitan form of Elizabeth. This name works very well internationally, but the major draw to the name was influenced by the character in Twilight. The Bella nickname suddenly swept America as one of the most desirable. It means "pledged to God". Isadora comes from Isidora which is the female form of the male name Isidore. Isadora comes from Greek elements meaning "Gift of Isis". As you can see above, Isadora is not even close to ranking in the US Top 1000. It wasn't used at all from 1958-1968, but it has been around since the 1880s, even ranking at a high of #654 in 1882. But that ranking only accounted for 9 births. I get the feeling this name will continue to slowly gain more usage over the next few years. There was a record 148 babies born last year with this name. Read more about this name here. Isabeau has only been used in the US since 1987. There were only 10 girls given this name in 2012. The only information that I can find on this name says that it is an Old French variant of Isabel. A famous bearer of this name was the wife of the French King Charles VI, Isabeau of Bavaria (1385-1422) also known as Isabeau de Bavière. Since Isabeau comes from Isabel, it also means "pledged to God" and would be an excellent alternative on the opposite end of the popularity spectrum. I sense that this may also gain a bit more usage in the near future, but I can't imagine it hitting the Top 1000 any time soon, if ever.